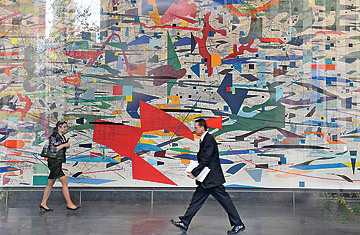 Mural, by Julie Mehretu, in the lobby of Goldman Sachs' New York City headquarters. In the lobby of Deutsche Bank's polished, corporate-chic London headquarters stands a sculpture by British artist Tony Cragg. Called Secretions, the piece looks like a jumble of giant human organs, but closer inspection reveals it is a mosaic of thousands of dice glued together. At a time when banks are disparaged as casinos, visitors may be surprised to read the small placard hung by Deutsche Bank on an adjacent wall. The sculpture's dice, the placard says, "may provoke comparisons with the nature of the bank's business." Its author, Deutsche Bank art adviser Alistair Hicks, who looks somewhat out of place in his crumpled blazer and mismatched trousers amid the sharp suits crossing the lobby, flashes a toothy grin. "I call us the subversive department," he says of the bank's art program, which is administered by him and six other advisers. "We are happy to not be just the smooth extension of Deutsche Bank branding." Few banks collect art to make money. A liquidation auction of art from collapsed investment bank Lehman Brothers in London on Sept. 29, for example, raised $2.6 million. Not bad, but it won't make a dent in the $613 billion in liabilities the bank had run up when it folded. Art confers respectability and respect, according to Joan Jeffri, director of the arts-administration program at Columbia University's Teachers College, and banks need those more than ever. From the mighty Medici banking dynasty in Renaissance Florence to the giants of the 19th century, like John Pierpont Morgan, art has been used to project status and power. You could argue that the banks have done a better job of acquiring art than they have of acquiring financial assets. What's more valuable: a Richard Diebenkorn painting or a toxic collateralized debt obligation? "The people responsible for managing these corporate collections have professionalized," Jeffri says. "Whereas it was once the wife of the CEO or some personal friend managing the CEO's interest in art, now banks have art departments and on-staff curators." At Deutsche Bank, Hicks and his team manage collections in more than 900 buildings in 45 countries. Their department is a cottage industry in itself; they produce a bimonthly magazine, offer tours to employees and clients and, most crucially, patrol the globe for fresh and provocative new works. They periodically present their purchasing ideas to a committee of bankers, which has the final say on acquisitions. That bankers, despite their fall from grace, still hold such a powerful place in the art world concerns some purists. The reason? When art becomes institutionalized, the line between prestige and corporate whitewash can become smudged. Jeffri points out that 30 years ago, when Big Tobacco was first coming under intense scrutiny over its lethal products, Philip Morris bulked up its art collection and began sponsoring exhibits under the slogan "It takes art to make a company great." In 2006 several prominent British artists and critics knocked UBS and the Tate Modern after the bank exhibited corporate art at the publicly funded museum. Art that is displayed in museums becomes immediately more valuable, which prompted accusations of a conflict of interest. Conversely, Royal Bank of Scotland came under fire last year for not sharing its collection despite receiving a multibillion-dollar taxpayer bailout. Critics contended that the art was now publicly owned and therefore should be available for viewing. Clearly, the inchoate criticism of banks' involvement in the arts is tied to a populist backlash in the wake the crisis. But there are legitimate concerns about just how deeply banks have become enmeshed in the art world, say experts. Cash-strapped museums in the U.S. have been accused of ceding creative control to corporations by accepting ready-made exhibits curated by banks' internal art staff rather than the museum's own curators. Bank of America, for example, regularly sponsors precurated shows in smaller American museums such as the Millennium Gate Museum in Atlanta and the Montclair Art Museum in New Jersey. Bank of America media-relations manager Diane Wagner says the company offers its art to public spaces as a way to reach out to the community. "It's part of our DNA to want to share our collection with people," she says. Jeffri says it's not that simple: "There are some dangers. A museum would not want to be known for giving over its space to private corporations. We need to think carefully about how banks and museums collaborate." On the whole, Jeffri and others say, banks are still a positive force in the contemporary-art world. Sotheby's Saul Ingram, who last year opened a European office for the auction house's corporate arts services, says that as austerity measures pressure state-supported arts around the globe, enthusiasts should be grateful for the banks' involvement. "We are in a recession, but banks continue to sponsor and support the arts," he says. "That's crucial if we don't want a 10-year gap in our culture." Colin Tweedy, CEO of Arts & Business in London, which works to establish links between commerce and culture, points out that patronage has been essential to art for centuries. "Artists have always had rich investors behind them, whether it's Tchaikovsky, Beethoven, da Vinci or Michelangelo," he says. For his part, Hicks, who has been busy preparing for the Deutsche Banksponsored Frieze Art Fair in London Oct. 14-17, insists that the company's collection "proves that the bank is about more than just making money." He delights in the fact that the company hangs a Sigmar Polke painting described on the accompanying text panel as portraying "the West's heedless consumerism" near the very boardrooms bankers use to maximize profit from that consumerism. "Our art creates friction and intellectual stimulation," Hicks says. "Isn't that what art is all about?" This article originally appeared in the October 18, 2010 issue of TIME.